The Soul Saver Dragon build is sometimes called the first modern deck. Certainly, it's left a serious mark on the history of the game, and the core strategy behind it is still commonly used today, but it's also been by and large left behind by modern sets. While Lohengrin, Alfred and Blaster-based cards like Gancelot have been reinforced in today's game, Soul Saver has essentially stopped developing right where she started. The build's namesake and focal card is Soul Saver Dragon, a base 10000 grade 3 built around auto rather than activate skills. The base 10000 alone should clue you in to the fact that she's an offensive unit first and foremost; and like Alfred before her and Garmore to come, Saver Dragon is a rearguard-dependent vanguard. Her first autoskill is to gain +3000 power when attacking a vanguard, forming an easy 21000+ line with either Marron or Toypugal for forcing strong defenses from units like Asura Kaiser and Dragonic Overlord where Alfred could not, but do note that with Toypugal, Soul Saver caps out at 22000, just short of pressuring a crossride. This is one area where she's aged, as the 23000+ vanguard line is an essential part of postcrossride formats. Her second autoskill, and her area of dependency, is to soulblast 5 on-ride to give +5000 power to three Royal Paladin rearguards. This is one of the original finishing skills in the game, setting up Palamedes and Toypugal, or herself and Marron to go for 26000 before triggers, which is perfect for when the opponent is at four to five damage, but there are three key weaknesses to the card. Before we jump into those, let's instead look into her support. Reading from lowest and moving up we find that Saver Dragon affects trigger bases, as the clan's first draw trigger to have a skill, Margal, can support her soulblast by moving to the soul to give another Royal Paladin unit +3000 power. That's one card less needed to fill up the soul with, at the cost of draining the extra lead that a draw trigger normally brings; the reason that this works so well is because Margal's +3000 can turn a 17000 line into a 20000 one, or 18 to 21000, so if the opponent is to defend that attack then they lose one card more just as you have lost one card more. Moreover, Barcgal was discussed in our previous module, but this is where the soul that we've built up with Llew really counts. The superior ride into Blaster Blade gives exactly the soul count necessary to pay for Saver Dragon's soulblast, ensuring that if you have an early lead then you can go for the endgame right from your grade 3 ride, or otherwise have a plan for the turn after you ride the King of Knights. In any format with the September 5th or August 1st restrictions in effect, Barcgal can no longer be used as the first vanguard, severely limiting his use and preventing any superior ride that he initiates from increasing card advantage, although some fighters still choose to run him as a one-card tech with the proper trigger bases. Drangal leading into Galahad is still generally considered the best replacement FVG for the English format, but any first vanguard that can reliably move back to the soul can suit Soul Saver's purposes. Next in support is Young Pegasus Knight and his corresponding grade 2 equivalent, Great Sage Barron. At 6000 and 8000 power respectively, these units gain +3000 power whenever a card is soulcharged in the main phase; that means that one Margal can bring their line up to 23000 power, or in a Lohengrin offshoot they can reliably hit for 20000 every turn. More reliably, you can run Pegasus Knight by himself as a booster that can reach 12000, though this will be difficult to manage over the course of multiple turns and if you aren't trying to hit 12000 then Toypugal is by far the easier card to meet the conditions for. To that end we have Pongal, a base 7000 grade 1 that can counterblast 1 in the main phase to move to the soul and add Soul Saver Dragon to the hand from the deck. This support Saver Dragon and Pegasus Knight simultaneously, allowing for the mystic dragon to come to hand very easily while increasing the soul for her use, but the maneuver also telegraphs to the opponent that you're going to ride Soul Saver, highlighting one of the card's key weaknesses. Soul Saver Dragon is more dependent on the rearguard than Alfred, and unlike the King, she can't conveniently call other Royal Paladins to assist her. There's a very brief window at the start of each turn to activate her skill with, but because it is on-ride, you need to have three rearguards set up in advance to pass the power on to, otherwise the soulblast is wasted. This translates to the back row having the most importance in a Saver Dragon deck, because the power can be passed on to boosting units who are more difficult to attack than the front row, but this doesn't necessarily save the Soul Saver cardfighter because of clans like Kagerou, Narukami and Megacolony, all of whom have some way of crippling your boosting units by either retiring them or preventing them from boosting. Among the last of the Dragon's support cards is High Dog Breeder Akane, a base 8000 grade 2 that on-ride or on-call can counterblast 2 to superior call one Royal Paladin High Beast. There are a couple of ways that this can play out; Akane can call Pongal for a base 15000 line, then move him to the soul later to get Saver Dragon into hand, she can bring out Margal for an immediate soulcharge to support the Dragon that will turn Akane into a base 11000 line for the turn, or she can bring out Lionmane Stallion to support a rearguard Alfred. That last move is particularly helpful if you do want to run Lionmane, since you can limit it to one copy and still bring the card out reliably, and it helps Akane support Alfred within his own deck, but within the context of Soul Saver, Akane's primary target is going to be Pongal or Toypugal. Toypugal is the more long-term option, since you're likely to intercept with Akane on your opponent's turn to make room for Palamedes and prepare Saver Dragon's holy charging roar, but Pongal will let you jump right into the Dragon in a pinch. Finally, our old friend Pendragon rears his head. Because of her +3000 autoskill, it is possibly to run four copies of Soul Saver Dragon with Pendragon as a backup fifth copy to limit break into her, avoiding Alfred altogether. Pendragon can break 21000-23000 while Alfred cannot, which does give some credit to this more modern take on the deck. Lohengrin can also support her in place of Alfred, and this is fairly consistent with Marron, Young Pegasus Knight and Toypugal all available to the Royal Paladins, but he's not particularly recommended because of the lack of a guaranteed 20000 line, lack of access to Lien for card changing, and for his soulcharge not being particularly practical toward supporting multiple soublasts, which would theoretically be the reason to include the clan megablaster in the deck. Soul Saver's ride comes with a steep cost, which in a format without Barcgal is difficult to pay even with all of this support, and very likely to cause one more card than normal to be dedicated to the vanguard circle, when it could have otherwise been used to pay for Iseult's cost or be called to replace a rearguard. 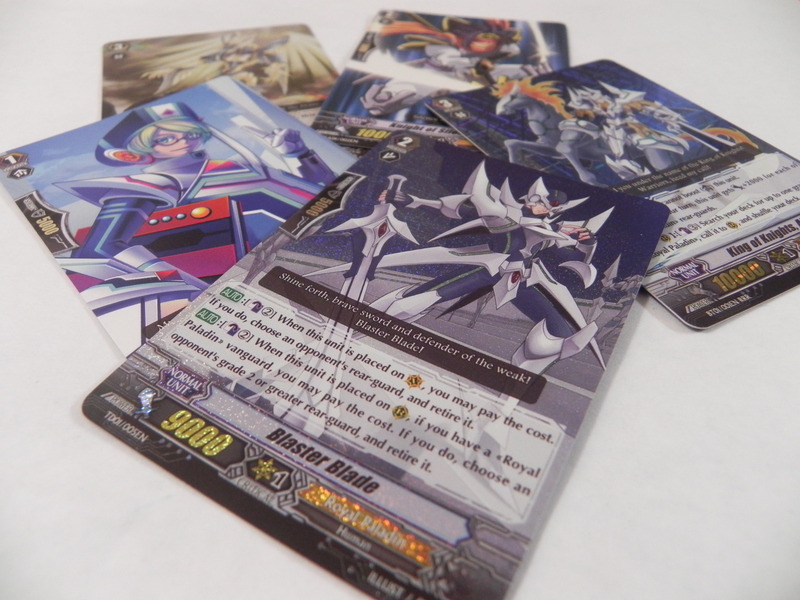 Blaster Blade was arguably one reason why the Soul Saver Dragon deck was perceived as being its own best counter for some time, as he could exploit the deck's rearguard reliance to retire the opponent's front row units and then go after the second line, which if one of the opponent's back line spaces was unfilled would cripple their strategy. In truth, Megacolony and Kagerou have the best matchup as mentioned above, since Giraffa can eliminate units early and go for 21000 every turn while Goku can clear out the back row with Berserk's help and Dragonic Overlord can handle the front. Other decks with Alfred-based units also have the option of assailing your Palamedes with their vanguard, severely dampening the strategy's power with an attack that it's difficult to justify dedicating the cards to defend against. The strategy itself plays on the Royal Paladin's strong superior calls to set it up, but its maneuvers are expensive and you have to budget both your counterblast and your soul carefully to bring it together. The deck's moves have become so definitive of the pro scene that at this point the deck could be called a cliché, with virtually no surprises among its ranks. However, Soul Saver Dragon comes with consistency, power and strong plays all throughout the early to endgame, making for one of the most solid decktypes that can bring its central play out the most regularly.